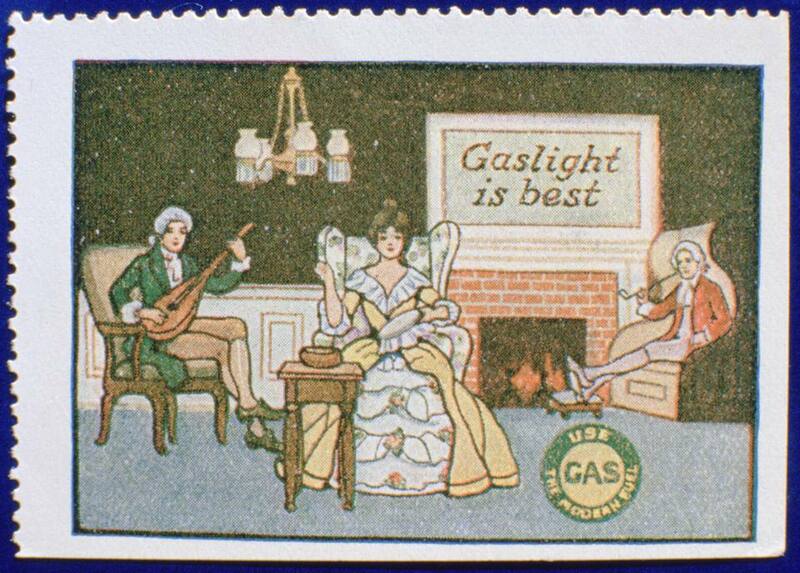 Early gas lighting advertisement label. When commercial gas became available in the early 19th century in Europe and America, a new way of lighting our homes, offices, and shops—even our streets—was available for the first time. From that time onward, we could install permanent lighting fixtures that were connected to a fuel or power source that was supplied from outside. We had to maintain and replace the mantles, and we had to light them by hand, but the days of buying or making candles, and of buying or rendering lamp oil, were over. We could have a system of pipes installed, with our fixtures mounted to them, and contract with the gas company to connect and supply our system. Of course, this meant one more utility bill to pay if we already had public water supplied. In fact, in many cases, it meant that we had our first utility bill. Municipal water and sewer service had started to become available earlier, but it took many years to implement and, often, the gas service became available first. Yes, the gas was supplied to our homes and businesses through underground pipes, just as it is today. But how did the gas company get the gas in the first place? One of the first pipelines to bring natural gas from a gas field to a city was completed in 1821. That pipeline brought natural gas from fields in Indiana to the city of Chicago, and it wasn't very efficient. Before that time, and for many years afterward, the natural gas we used to light our homes was actually manufactured in the town we lived in. The gas that we used to light our spaces during the Gaslight era was coal gas. It was natural gas, but it was manufactured by heating coal in an oven that was sealed to keep oxygen out. Then the gas was purified—filtered—pressurized and piped to our homes, businesses and street lights. It was made by the process we know today as "coal gasification." In 1792, William Murdoch used coal gas to light his house. At the time, Murdoch was working for Matthew Boulton and James Watt at their Soho Foundry steam engine works and had been assigned to oversee the company's engines in a tin mining operation in Cornwall. He was experimenting with various types of gas, to see which might produce the best light. He decided that coal gas as the most effective, and used it in his house, in part, as a demonstration. This was the beginning of the Gaslight Era. By the early 1800s, gas street lights were becoming common in most major cities, and the installation of gas lighting systems was well underway. Very late in the 19th century and early in the 20th century, electricity gradually replaced gas as the source of lighting, with the interesting period of dual-fuel (gas and electric) fixtures over a period of about 20 years as part of the transition. Gaslight fixtures were installed below ceiling height for two reasons. The most important one was that they made the light with a flame, so the actual lighted bowl had to be kept a safe distance away from any materials that it might ignite. A second reason was that the gas to the fixture was turned on and off with a valve, or valves, that was built into it. That, plus the fact that the flame had to be lit after the gas was turned on, meant that you wanted the fixture to be reasonably easy to reach—either from the floor or with the use of a small step-stool if needed. The result of this is that true gas light fixtures, and the most authentic reproductions, are chandeliers, pendant lights, and wall sconces. They had (and have) open bowls, usually made of glass and often ornate, which hold the lighted mantle—or, in modern fixtures, a light bulb. In the original fixtures, the open bowl was needed to allow the products of the combustion to escape. It also directed most of the light upward. Using glass for the bowl allowed the light to spread sideways and, to some extent, downward.